Last week you may have seen that I made some Halloween cupcakes and today I am sharing with you a recipe for Pumpkin potion muffins in collaboration with Discount Supplements. The above recipe is easy to follow and makes 12 delicious muffins. Below are half of the muffins we made just to give you a glimps of how they turned out for us. You of course can choose to decorate them if you wish or leave them plain like we have. We baked our muffins in the oven for 24 mins and they turned out perfectly. I would recommend that you add less nutmeg if you prefer a subtle taste. Overall these were delicious muffins to tickle your taste buds. 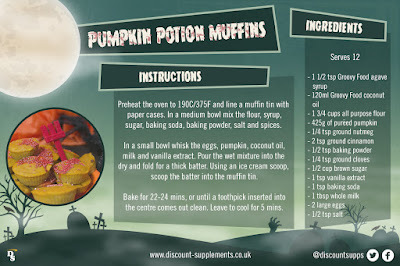 Perfect for the autumn season especially for Halloween. * We were gifted an ingredient budget as well as some Groovy Food coconut oil and agave syrup for the purpose of this post.